Yoga Dork recently posted the trailer for the latest of the many yoga documentaries and it got me thinking…yoga and the media. Not sure how I feel. While I’ve learned a lot about yoga’s history and evolution and was exposed to many styles, traditions and teachers through watching these films…I am still undecided as to the impact they have on society’s understanding and perception of the practice that is so personal to me…or even it if matters? 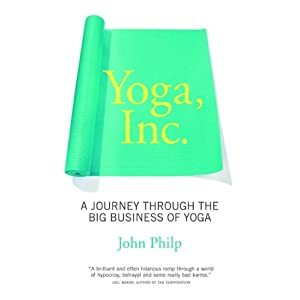 Yoga is big business and currently extremely trendy, stylish and “cool”. All of these movies prove and contribute to that. And all of that attention=money. And all of that money=power. Too much power can go to your head, be taken advantage of, and result in harm…even for yogis. I just want the practice to remain pure. Here are a few trailers…food for thought. What are your thoughts on yoga and the media? The world needs yoga. This stuff is powerful and intense. It has the power to harm when held tightly, studied without practice, and posed rigidly. Done right, it also has the ability to heal and cure. The 5th chakra is the Vishuddha, which translates to “purity”, “purification”, or “pure place” from Sanskrit. Located in the neck, shoulders, throat, mouth, tongue and jaw, the Vishuddha chakra is the gateway from the lower, more material/physical energy centers (chakras 1-4) to the upper, more spiritual/metaphysical 6th and 7th chakras. It governs our ability to communicate, self-express, create, and listen. Imbalances in the chakras are thought to result in illness. These invisible energy wheels can either spin too fast or too slow; leaking energy out or blocking energy flow within. Physically, excessive or deficient energy flow in the 5th chakra can lead to thyroid imbalances, teeth grinding, neck/shoulder stiffness or tension, hearing/speech problems and throat/jaw ailments (such as chronic sore throats or TMJ). Imbalance can also manifest as excessive talking, interrupting, manipulative behavior, inability to listen, shyness, fear of speaking, inability to express yourself clearly, stuttering, lying, keeping secrets, addiction to smoking and being “wishy-washy”. The good news is that yoga, meditation, and diet can get your wheels to spin just right. Simple neck rolls, Ustrasana (Camel pose), Setu Bandha Sarvangasana (Bridge pose), Sarvangasana (Shoulder stand), Halasana (Plow pose), Matsyasana (Fish pose), Purvottanasana (Upward plank pose), and Bhujangasana (Cobra pose). ***If you are experiencing any neck “issues”, pain, etc., please practice under the guidance of your teacher. Most of these poses can still be practiced safely, but may need to be modified. Practicing Ujjayi pranayama (victorious breath), Jalandhara bandha (net-bearer bond or throat lock), and chanting Om or “Ham” or any mantra of your choosing will also get the energy moving through the Vishuddha chakra. Come into a comfortable position, you can choose Sukhasana (with blankets under your hips or even leaning against the wall), Savasana, or just sit in a comfy chair. Eyes closed, hands where they feel good. Bring attention to the neck, throat, mouth, jaw, and shoulders. Begin to breathe deeply to relax them, one by one. Visualize a beautiful sky blue light appear to illuminate this region of your neck and throat, and see it take form into a blue lotus flower with 16 petals (you can glance at the picture below for help here). Imagine the light brighten with each inhalation and dim a slight bit on exhalation. Inhale- the light brightens. Exhale- the light dims a slight bit. Timing your meditation helps. Start with 1 minute and increase from there. 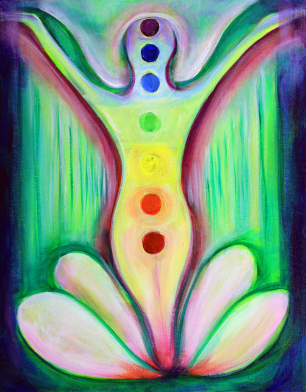 Finding balance within the 5th chakra means making a commitment to choose your words. Communicate with truth, kindness, peace, and love. Close your mouth, cordon off your senses, blunt your sharpness, untie your knots, soften your glare, settle your dust. is not moved by attachment or aversion, swayed by profit or loss, nor touched by honor or disgrace. He is far beyond the cares of men yet comes to hold the dearest place in their hearts. This, therefore, is the highest state of man. Communication starts in the mind with a thought. Learn to filter yourself first in those moments. Ask yourself, “Does this thought foster positivity and love?” If not, end it there. If you find yourself thinking about lying, stop it there. Choose silence. If you find yourself thinking negatively, judgmentally, or unkindly about someone else…stop it there. Think about something else or think instead of that person’s good qualities. If you find yourself in a group of people engaging in gossip, trash talk, or even simply talking about someone that is not there…excuse yourself and walk away. Our words have significant power. Our voices are meant to be pure and the throat chakra used as a place for purification. When we lie, gossip, blab on and on about nonsense, and insult or speak at others in anger, a ripple of negative energy is emitted. Choose silence instead. Remember the old addage, “If you have nothing nice to say, then say nothing at all”.